LED lamps are similar to conventional incandescent light bulbs – externally. But they consume only about one-tenth of the energy. The market for innovative light source is huge. Engineers and technicians of the Seidel GmbH in Marburg, Germany, have analyzed LED lamps on the market. The result of the analysis: a mix of materials that are not optimally designed and poorly recyclable. 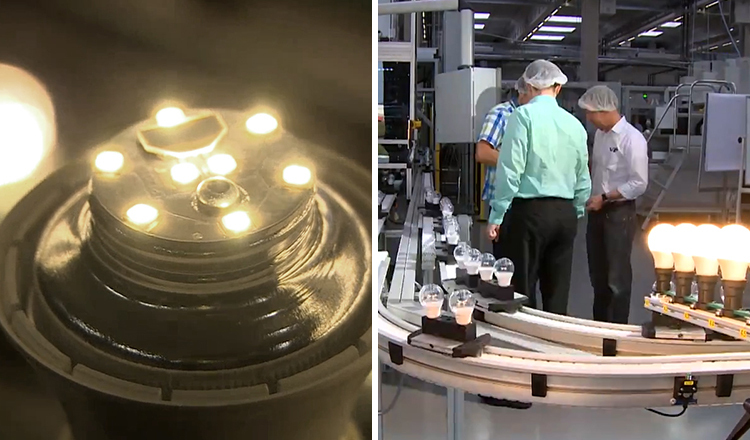 The goal of Seidel is to enebale the material-efficient production of LED lamps in Germany. Because the majority of today’s LED models are imported from the Far East. With a completely new design of the lamps, the Seidel company allows a material-efficient production of LED lamps. Fewer components that are assembled only by means of plug connections and eliminating glues and tin for soldering makes the lamp about 60 percent lighter than comparable products. The savings potential of the new LED lamps can also be calculated by a tool of the Federal Environment Agency of Germany (Umweltbundesamt). With a special matrix environmental effects can be calculated that amount to the preproduction of the materials that are used. In the film, you will also see how this calculation matrix was applied and how the Seidel GmbH helps to use less material for producing LED bulbs. How LEDs are constructed and work: LED luminaires save energy.